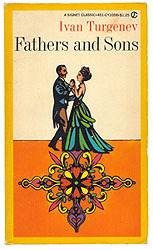 Read Ivan Turgenev, Fathers and Sons (in its entirety). What were some of the causes for the rift between the "fathers" and the "sons?" Before proceeding, you might wish to read the short background information and review the study questions on Turgenev. Your assignment should be sent to your course instructor following the directions for submitting assignments. Please take a moment to review Charlie's History Writing Center for specific information on the writing requirements for the assignments in the course. The Required Turgenev Paper is worth a maximum of 100 points.